"Doin' whatever when I can"
Many of you know this, but there might be people that do not. I run an archive called The StepMania Archive, which focuses on archiving everything of StepMania, when it comes to builds, themes, and things like that. Currently I'm in the process of creating the Theme Archive,which you can visit the preliminary version here. 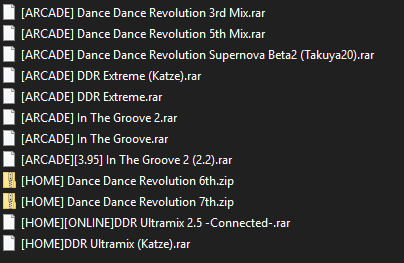 In the builds archive you can find builds of every single version of StepMania imaginable. And it's updated constantly with new builds and info. In the themes Archive, you can find themes for these builds. Pretty much that's all I've got to say. Thanks for checking the thread. O2Jam MIX Season 2 coming soon! I do have the themes locally, but as of right now, they're not there as I do need permission of the author to host them there. I do the same thing for the Build Archive. I've already got some themes rejected for archiving due to distribution/personal/community reasons (few of which I'll keep disclosed as some want it to be forgotten) but I'll attempt to contact the author of CS and see what they think about it. If I'm not able to host them, I'll at least list them unless said otherwise. Update: Might not be able to talk with him about the themes. Update 2: Found out the themes are licensed under CC BY-NC-ND 3.0, so it should be okay to host them, As long as I don't alter any of the files. Your archive is amazing. I discovered Neon FM on it myself. Simply having builds' release dates can prove useful in the future. I hope to see the theme list grow as well. Even if not all themes get uploaded I would love to see information about them listed, especially the names of the authors. Following this thread. I've still got a bunch of SM3.9 themes if you're missing any. I'll make a list of what I've got and post it up. Will you host SM5 themes too? Also, will Noteskins, Characters and Announcers be hosted? I'll make a list of all of those that I've sourced too so if you're looking for things I might be able to help. Currently I'm only doing Themes and Builds, but I can definitely expand on those fields as well. Also yeah, that can definitely help! And yeah, definetly themes from all SM builds. Oh, by the way, please refer to this when it comes to the themes. I've already got some themes rejected for archiving due to distribution/personal/community reasons (few of which I'll keep disclosed as some want it to be forgotten) but I'll attempt to contact the author of the theme and see what they think about it. If I'm not able to host them, I'll at least list them unless said otherwise. There's also a few additions coming to the Theme archive shortly. "Fly off to the right and explode"
I have a few D3MIX themes so you can add to the list, you need it? Made by the smexy Lord Toon! What's the link to the Theme archive? About the Cyberia Style series: if anything, they can be downloaded from the official site... well, sort of, with the help of the Wayback Machine. Will there be a noteskin archive or something like that? Slight correction: these Solo-chart dedicated SM themes were released as Keys X Six (a pun on the manga/anime KissXsis). Ah, got it, I'll replace them in a bit. Want help with some themes? If you happen to have themes that are not listed there or are quite rare, definitely feel free to post them or PM me about them. Note: Just realized that several SM5 themes are locked out for the public, I forgot to adjust the permissions for those files. Sorry about that. I'll fix it eventually in the morning. do you have in the groove 1? I still have ITG 1 (Complete in PC, just the demo in macOS), but I haven't placed it on the archive due to legal concerns. Right now, only the demos are placed. legal concerns as in? the songs? Same thing for me. I missed CyberiaStyle & its themes. CyberiaStyle releases always had a timed release. The main reason they're gone however, is due to personal reasons and also not having so much interest. Fourteen years have passed since this theme series started. In addition, CyberiaStyle LAST APPROACH is officially released and 3 years have passed in 2018/04/05. Thank you very much for using it in all works. At first, I wanted to continue publishing as it is. However, there are various factors and changes in my personal circumstances and taste preferences, but I felt that if I continued this series for a long time, I would not proceed to the next step. The situation of the StepMania game has changed significantly, and there are no plans to release new releases, so long years have gone by and I thought it would be over. It's a self-placing, but please acknowledge that it was in this form and that it was a sudden notice. Thank you in advance for the CyberiaStyle series.